Hat displays and racks are an effective merchandising tool to increase sales. While it's important to retailers to first focus on store fixture staples like shelving, display tables and register stands - accessories like display racks are the finishing touch needed to help boost sales. 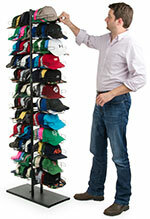 This collection of hat stands offers multiple options for merchandisers to meet specific needs. 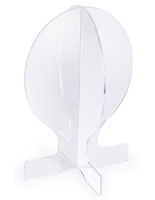 Countertop stands sit comfortably on any display table and are ideal for stores that offer a small hat collection. Sell derby or cowboy hats? What about sun hats or fedoras? Boutique style stands are ideal for non-baseball style caps. 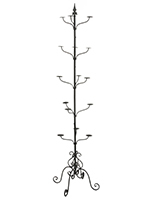 The wrought iron construction and spiral design of the hat display stands fit really well with a more decorative, high-end setting. Is your store already equipped with slatwall configurations? 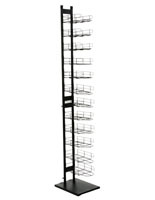 Several different slatwall hat racks are available as well. The beauty of a well-arranged slatwall setup is the versatility. Owners can swap different displays in and out to accomodate new product lines or different items. Sporting goods stores can really benefit from slatwall, as products are available to effectively display both baseball caps and athletic sneakers. With an easy to rearrange setup employees can save valuable time for other important tasks. Slatwall hat displays are one of the simplest, yet most effective ways to outfit your specialty store. Floor standing displays, especially hat display stands, are the ideal choice for diplaying bulk quantities of merchandise. 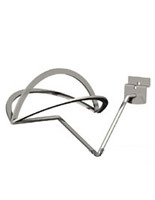 These hat rack stands can be placed anywhere in the store. 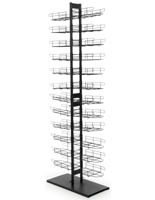 The slender & narrow tower design helps conserve floor space while allowing for up to 240 caps to be on display. 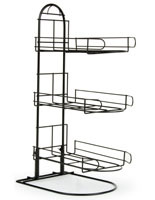 Double-sided racks are great aisle displays and catch customers attention as they browse for other products. Tower style displays are easy to move around and retailers can experiment with different locations to try and improve sales.